Russian proxies doubled the number of attacks in ATO zone and used Minsk-proscribed weapons in all sectors. “In total, the enemy committed 29 ceasefire violations yesterday. Ukrainian troops returned fire 17 times,” reported Ukrainian Ministry of Defense spokesman on ATO Colonel Andriy Lysenko at a press briefing at Ukraine Crisis Media Center. In Luhansk sector, militants were active all day long starting 06:00 near Krymske, Novozvanivka, Valuiske, Troitske, Stanytsia Luhanska, and Novooleksandrivka using grenade launchers and small weapons. Each attack continued for 5-60 minutes. “The enemy used 82-mm mortars twice near Krymske and Triokhizbenka, firing a total of five rounds,” elaborated Col. Lysenko. In Donetsk sector, Russia-backed militants used 120-mm mortars near Troitske firing a total of seven rounds around 16:00. “The enemy attacked Ukrainian strongholds near Zaitseve and Luhanske using IFV. In total, Russian proxies opened fire at our positions near Avdiivka, Zaitseve and Kamianka 13 times, and attacked the area near Pisky and Luhanske three times using grenade launchers and small arms. 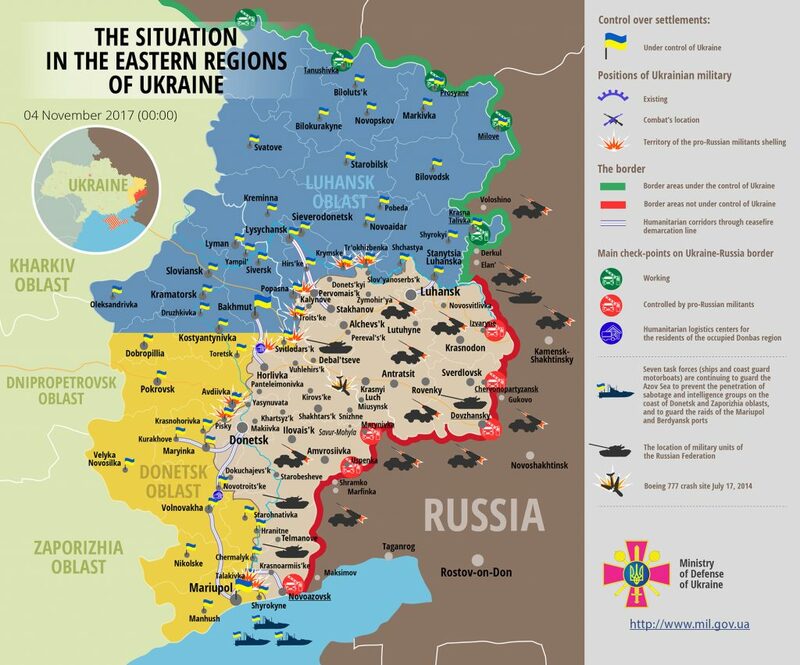 Militants opened random fire several times in an attempt to find our firing points,” said Col. Lysenko. Ukrainian troops returned fire eight times. In Mariupol sector, six ceasefire violations were recorded. Militants opened fire three times using machine guns, grenade launchers and small arms between 09:00 and 12:00 in Vodiane. “After 16:00, Russian proxies attacked the areas of Pavlopil, Talakivka and Taramchuk, engaging each stronghold once,” informed the spokesman. Three Ukrainian soldiers were wounded in action near Kamianka, Avdiivka and Novooleksandrivka. They were promptly evacuated to military mobile hospitals. Report on the military developments as of November 3 is available here. Interactive data on the shelling: chronology shelling chart and the interactive map.